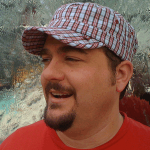 Today’s interview is with a guy who I always find funny: Chad Swaney, @chadarizona. I had a blast in this interview and hope you see why I enjoy every opportunity that I get to hang out with Chad. He’s a great guy and always willing to crack the perfect joke to get you to laugh at yourself. In his own words he seeks out the truth in situations and typically finds comedy to be one of the more effective tools in being able to get there.